The experts in exploring across the UAE and GCC, Explorer’s talented cartographers have been creating beautifully illustrated maps of trekking routes for decades. 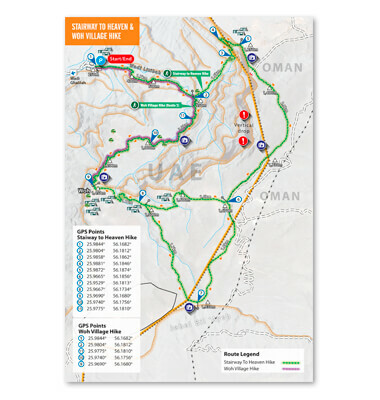 Clearly marked on detailed area maps or satellite images, our creative team uses bold colours and line styles, and easy-to-follow directions to help hikers discover the best of the natural world in the region. The maps feature essential points of interest, such as hospital, hotels, campsites, landmarks and attractions, and are packaged in the most convenient format for the user, whether a novice or seasoned hiker. A trekking handbook provides general advice about the terrain, useful tips and safety advice, as well as a directory of hotels and hospitals, while the individual routes can be presented as pocket-sized cards.